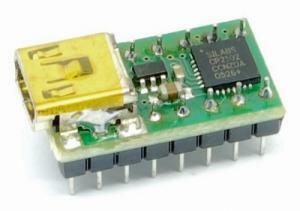 ioMate.USB1 is a universal USB UART interface adapter module for connecting microcontrollers, FPGAs, etc. to the USB bus. See infosheet for details. ioMate.USB1 converts data traffic between USB and UART formats and includes a complete USB 2.0 full-speed function controller, bridge control logic and a UART interface with transmit/receive buffers and handshake signals. ioMate.USB1 provides a 5-pin USB mini-B connector for USB cable connection, as well as pin headers with UART signals. ioMate.USB1is being shipped without preassembled pin headers, since everybody has different preferences (pin headers up or down, or receptacles up or down, or rather angular pin headers...).